Today is Martin Luther King Jr. Day, on which we celebrate and remember Dr. King's life, work, and advocacy for civil rights and equality for all. 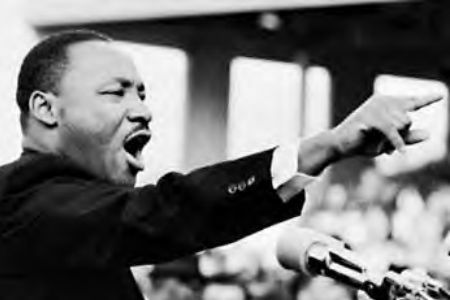 It has been almost 50 years since Dr. King gave his famous "I have a dream" speech. As you grow, I hope to make it an annual tradition to recognize this day by reading or listening to Dr. King's speech in its entirety, and discussing what we can do to help make his dream come true. For me, today, that discussion is focused on privilege and mindfulness. If just reading that word privilege makes you feel defensive, or if you're unfamiliar with the use of the term in the context of social activism, please take the time to read the most comprehensive and easy to understand explanation I've come across: Of Dogs and Lizards: A Parable of Privilege. But just how do those of us with big feet go about being careful where we walk? There are many, many sources of privilege. There is white privilege, male privilege, able-bodied privilege, heterosexual privilege, class privilege, religious privilege, and more. If you see yourself in that list and the hairs on your neck are standing up, and you're feeling compelled to defend that you did not choose any of these sources of privilege, take a deep breath. I'm not accusing you of anything. I know you did not choose to be privileged, anymore than the people who don't see themselves in that list chose to be oppressed. Most of us are some complex combination of privileged and oppressed. It's not good or bad, right or wrong, it just is. Hey, you know what? That's kind of important. I'm going to say it again. Most of us are some complex combination of privileged and oppressed. It's not good or bad, right or wrong, it just is. It's important because of the common reactions in discussing mindfulness and privilege. If you're a white woman, and we're talking about white privilege, you might be thinking (or saying): "Yeah, but I'm a woman! I'm oppressed too!" If you're a man and we're talking about male privilege, you might be thinking (or saying) "Yeah, but I'm gay! I'm oppressed too!" "This note was a promise that all men, yes, black men as well as white men, would be guaranteed the 'unalienable Rights' of 'Life, Liberty and the pursuit of Happiness.'" and little ol' feminist me thought: "Well yeah, but what about black women and white women? How dare I? I had the opportunity to listen to a black man tell me what it's like to be a black man. But I didn't listen. I wasn't mindful. I was momentarily offended that this black man didn't think to incorporate the oppression of women in his speech. And really? Why should he? He's not one. If he'd tried to address the additional and intersecting issue of women's oppression, I surely could have found fault with that, because as a man, he couldn't truly understand the oppression of women, just like as a white person, I cannot truly understand the oppression of people of color. As a white person, listening to a black person talk about being black, it's not my place to respond by telling him what it's like to be a women. It's my job to listen to him and believe him. So I reminded myself to just shut up and listen. He wasn't telling me about me. He didn't need to, because I already know about me. He was telling me about him, and I needed to listen, without judgement, without interpretation, just listen. This is my challenge to myself, and to you, if you'll take it. Just listen. If you're able to truly empathize, feel free, but if you can't, just say thank you. When you notice your privilege, or when someone else brings it to your attention, be mindful of it. Thank them. You don't have to apologize for it. You don't have to defend it. You don't have to rationalize it or explain it away. Just notice it. If someone tells you about their experience of oppression, just listen. Don't correct them. Don't counter with your own stories of oppression, making it a "Who's More Oppressed?" contest. Just listen, and thank them for the opportunity to have a glimpse into what people with other experiences feel. It's not about you. It's about having compassion for others, having respect for differences, and being at peace with the fact that systems of privilege and oppression exist. Until we can admit that they exist, we can't take any meaningful steps toward changing them. Come back tomorrow for Privilege and Mindfulness: Part 2, where I'll share how I became more mindful of my own privilege, a big step in learning to listen to and believe others who are oppressed in various ways. I wish I had read this in college. My own privilege was pointed out many times during classes and it always made me feel uncomfortable because there was nothing I could do about my skin color. I was "lucky" enough not to have the audacity to reply but I did talk about it later with friends. It wasn't very healthy but it is something that I want to teach my children how to handle gracefully and this is a great start! Can't wait for part 2. It is seriously one of the best things I've read on the topic!